For sale is the Trading Card pictured and listed in the title. I have included a high quality scan of the front and rear of the card. The pictures are of the actual card you will receive. 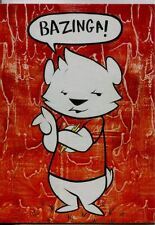 BIG BANG THEORY PSC ACEO HAND DRAWN ART SKETCH CARD. Condition is Used. Dispatched with Royal Mail 1st Class Large Letter. "Standee Cards" Set of 7 Chase Cards. BIG BANG THEORY SEASON 5. We also buy trading card collections. The cards are in M/NM condition. Add to Favourites. I have included a high quality scan of the front and rear of the card. 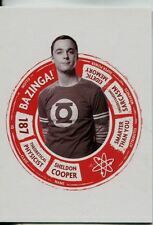 M21 VARIANT "Sheldon" Wardrobe Card. BIG BANG THEORY SEASON 5. The card is in M/NM condition. We also buy trading card collections. ALICE AMTER AS MRS. KOOTHRAPPALI A13 AUTO CARD. BIG BANG THEORY SEASON 3 & 4. THE CARD IS IN M/NM CONDITION. Card shown is the one you will receive. JOHN ROSS BOWIE AS BARRY KRIPKE A10 AUTO CARD. BIG BANG THEORY SEASON 3 & 4. THE CARD IS IN M/NM CONDITION. The Big Bang Theory: Season 5. Ash Trading Cards. 68 Card Basic/Base Set. 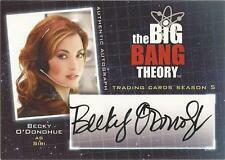 We are one of the UK's Premiere Trading Card Dealers. KEVIN SUSSMAN AS STUART A9 AUTO CARD. BIG BANG THEORY SEASON 3 & 4. THE CARD IS IN M/NM CONDITION. M31 "Bernadette" Wardrobe Card. BIG BANG THEORY SEASON 5. The card is in M/NM condition. We also buy trading card collections.